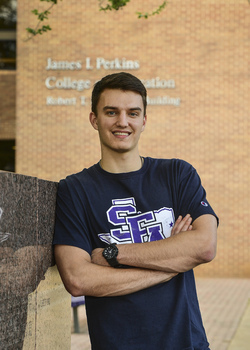 Stephen F. Austin State University student Ben Dickey was chosen as a finalist in the Undergraduate Research Conference for his research project "Developing Intercultural Awareness through a Study Abroad Program." Dickey, a senior elementary education major from Austin, will present his research starting at 4 p.m. Tuesday, April 17, in the Twilight Ballroom. NACOGDOCHES, Texas - When Stephen F. Austin State University student and Undergraduate Research Conference finalist Ben Dickey went on a study abroad trip to China in May of 2016, he came back with firsthand experience detailing the importance of intercultural awareness. "Right now our society is globalizing very quickly every day, and with this comes a lot of diversity," Dickey said. Dickey, a senior elementary education major from Austin, was chosen as a conference finalist for his research project "Developing Intercultural Awareness through a Study Abroad Program," an ethnographic case study analyzing his experiences during an eighteen-day trip abroad. The conference seeks to highlight exceptional research projects from each of the university's six colleges and one regional college. While in China, Dickey wrote daily journals and discussed his experiences with professors. Later, he went back and analyzed these discussions as well as a reflection paper he wrote while abroad. According to his research, there are three levels of intercultural awareness. "With basic cultural awareness, you're conscious of people who are different from you," Dickey said. "Then you progress to the second level, maturing, with more fluidity with culture. Finally, you get to the third level, which is intercultural awareness where you understand and you're able to make those interactions and, in time, adjust and adapt those interactions with different cultures." Professors who accompanied him on the trip acted as culture guides, discussing with him some of the culture shock he experienced. Especially as it relates to teaching, developing intercultural awareness is vital, he said. "If you look at the demographics of our teachers, 82.7 percent of our teachers are white, not Hispanic. Yet, our student population continues to diversify," Dickey said. "These teachers who come from one culture need to be able to interact with students from a diverse population." This awareness is key in professions centered on making connections, he said. "If you're very ethnocentric, only thinking about yourself, you're not going to be able to develop those strong relationships," Dickey said. "You need to be able to connect with students, guide them and have that safe environment for them to learn - or else you're going to do a disservice to them." Because he plans to work in a Title I school after graduation, the research has a personal application for him. "I want to be able to learn more about other perspectives in society and how I can relate to them," Dickey said. "Just being able to experience being immersed in the culture, and learning and feeling what it's like, helps, and it's definitely something you need to do when you're interacting with different populations." In addition to conducting his own research projects, Dickey started the Undergraduate Research Club on campus. "I really want to be able to spread undergraduate research to more people and for them to have the opportunity to go to more conferences and be able to publish their work as well," he said. The aim of the club is to familiarize students with the research process and help them get more comfortable with presenting their work. "I'm delighted with the way Ben has taken the initiative on this club," said Dr. Michael Tkacik, director of the School of Honors and professor in the Department of Government. "Students who engage in undergraduate research demonstrate intellectual curiosity, creativity and perseverance, all sought-after traits for employment or graduate work. The club allows Ben and the other members to showcase these traits." Dickey also serves as a tutor at the Academic Assistance and Resource Center and student teaches at Thomas J. Rusk Elementary School. He plans to keep working at maintaining intercultural awareness. "Once you develop it, it doesn't just stay there," Dickey said. "You have to be constantly working and developing it." Dickey will present more of his research on intercultural awareness at the Undergraduate Research Conference poster presentations starting at 4 p.m. Tuesday, April 17, in the Twilight Ballroom.